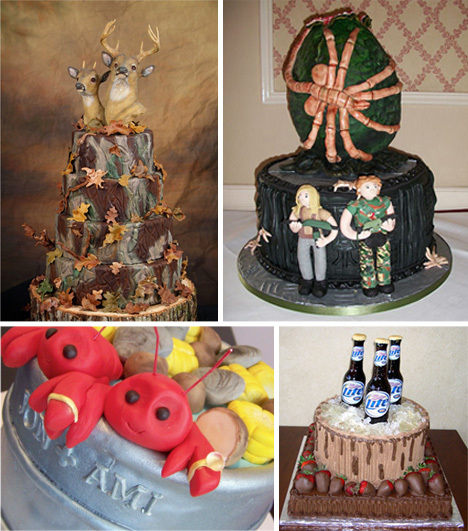 Wedding cakes are the ultimate showpiece for any skilled baker. No matter how amazing one’s cakes are when making the typical elegant creation that most brides and grooms want, the real test is how one handles a more creative request. 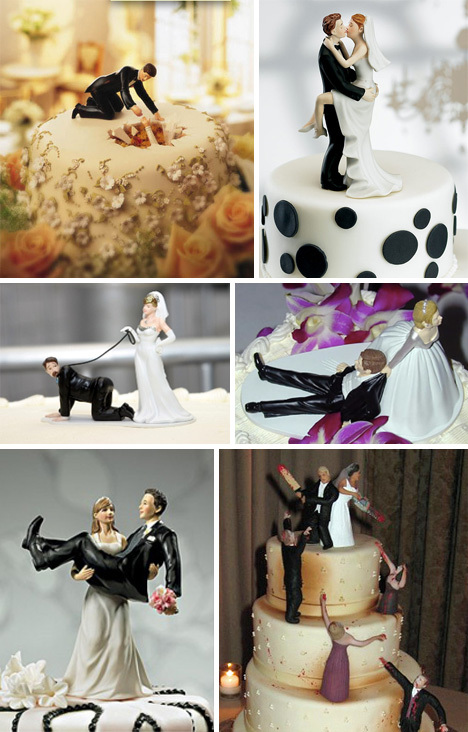 The easiest way to make a cake out of the ordinary is to top it with a creative bride and groom. Everyone is familiar with the standard couple standing stately at the top of an elegant cake, but how about the bride carrying the groom? Or the two fighting off a wave of cake zombies? Videogame nerds often marry videogame nerds. The result? 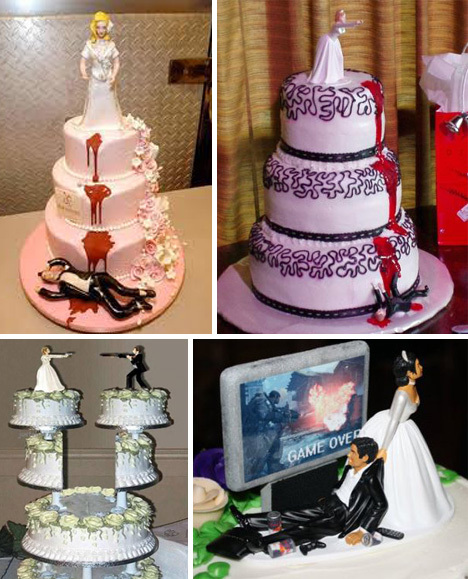 Videogame wedding cakes that blow the lid of wedding cake conventions. Giving a baker some creative license can yield the most interesting cakes of all. 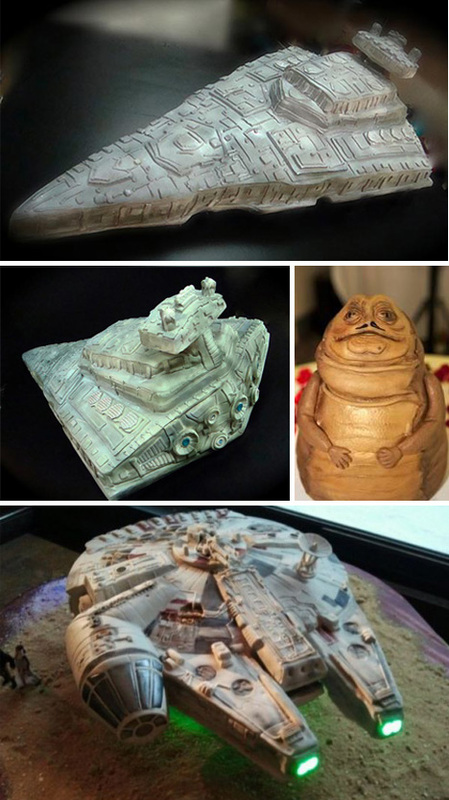 Giant war ships on the open sea, luggage to showcase the couple’s mutual love of travel, or entire scenes from their lives can be sculpted and eaten by an excited wedding party. 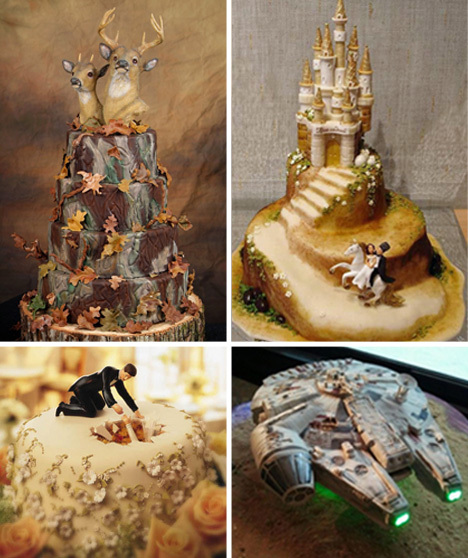 A Star Wars wedding cake is arguably the best idea anyone has ever had. Clearly several people have decided to go this route, as the variety of cakes is broad and the quality, fantastic. 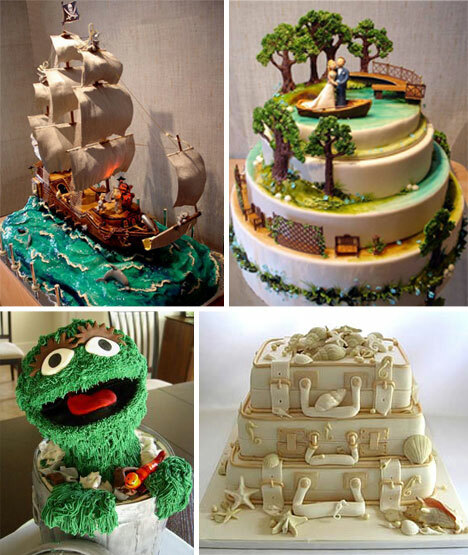 Some creative wedding cakes are quite a bit on the quirky side. 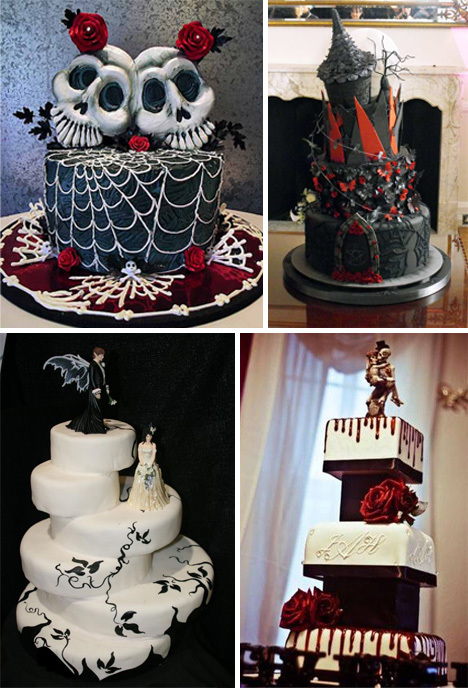 One assumes that some of these creations are groom’s cakes, which tend to have more flexibility for fun versus elegance. Here are two cakes that will cause a stir. 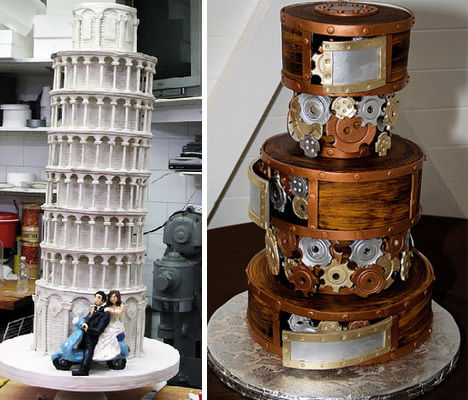 An intricate leaning tower of Pisa and a steampunk-styled creation are both eye-catching conversation starters. The only difficulty is how to cut them! So many girls have dreams of their perfect wedding, and they also have dreams of marrying their own prince charming in the process. 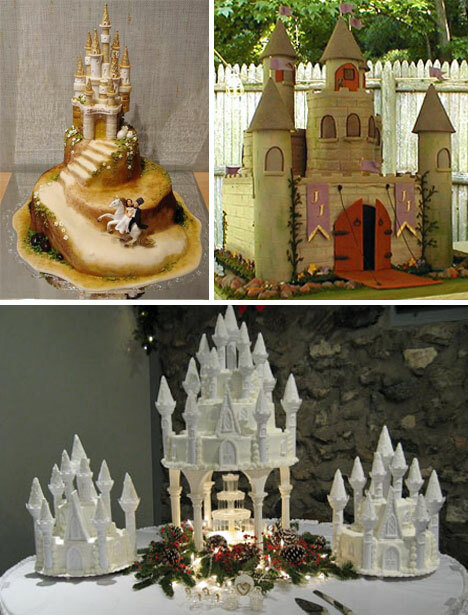 Why not combine the two and display the fulfillment of these goals with a giant castle cake? 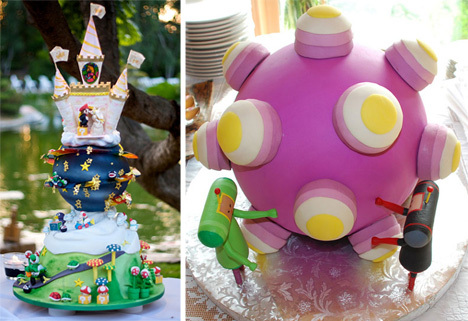 These towering creations are eye-catching and look like a lot of fun to eat. Some wedding couples either have a great sense of humor, or a lot of latent aggression. These cakes are a bit hostile, to say the least, but they succeed in their aim: to grab everyone’s attention!